A modern classic in its' own right. The Equilibrium is the quintessential 4-season UK road bike, beautifully crafted from Reynolds 725 heat-treated chromoly and available as an accessible frame-only option for endless build possibilities.Stunning classical looks in an eminently practical package - a modern day success story that proves that steel is still a material to be reckoned with given the right application. The Equilibrium is designed to mix comfort, speed and efficiency in a package suited to the less-than-perfect tarmac of the UK. Reynolds 725 Heat-Treated Chromoly frame. 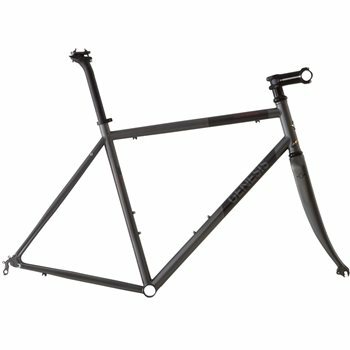 Carbon Road 1 1/8 inch fork with alloy steerer. Require 28.6mm front derailleur clamp. Requires english 68mm threaded bottom bracket. Includes 1 1/8 inch headset.